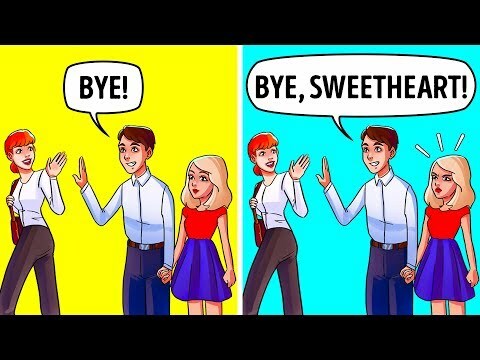 What are the types of girls guys date before meeting the one? Finding your one and only true love can be quite a journey. While girls believe it’s mostly a challenge for them, guys face the same struggles. They meet a whole bunch of different girls on the way to finding that special someone. Dr. Samantha Rodman, a clinical psychologist and dating coach, believes that every girl can be classified as a certain type. No offense, ladies, but it looks like most of you belong to one of 10 categories — unless you’re already a category 11, which means “the one” to someone. Let’s see if you agree with the divisions and recognize yourself as one of the types. – Whatever a guy does, he’ll never be better than her father. And according to Dr. Rodman, a breakup is likely to make the man feel much worse than the woman. – A party animal definitely knows where the good parties are and which clubs are the best. If a man wants to accompany her, he’s going to have to be OK hanging out with a lot of people she knows. – A smart and well-educated girl — what could possibly go wrong here? Well, you can have a long and interesting conversation with this girl, but only if she can find time for it because she’s crazy about her studies and takes additional classes and extracurriculars. – Jealousy in a relationship is normal, but only when it doesn’t get out of hand. A girl that always reads between the lines and looks for a reason to get angry is a red flag. These girls are scared of being alone. They see a prospective threat in any other woman their guy ever greets, be it a colleague or just some acquaintance. – When in a relationship with this girl, men often think that Miss Jealousy is a better option because at least she thinks about him instead of thinking and talking about completely different people. – It’s very likely that this man will soon get the feeling that his girlfriend has a relationship with both him and his mother. This is definitely not a good situation for any guy. – She’ll bombard him with text messages to check on him every 10 minutes. It’s not about being jealous; it’s just that she worries too much. – There’s never a dull moment with drama queens because they are so emotional, and the relationship is never easy. It’s not difficult to get them to go somewhere, but at the same time, they often create drama even when there’s no good reason for it. – Fancy Girs are trendy and stylish, and they know everything about fashion. They know which clothes to wear to attract attention, and they’re the ones who always look perfect. So what could possibly go wrong here? – Beauty Queen, like a fancy girl, is very beautiful, and she gets a lot of attention from men. Most of the time, the guy who dates her doesn’t even understand why she chose him. – But “the one” is a girl who laughs at her boyfriend’s jokes, and he laughs at hers. She is someone who might have completely different tastes in art, cinema, or music, but they still have a lot in common. She is good with her boyfriend’s mother and his friends. I'm a tomboy with a pure hatred to fashion, idiots, jerks, pink, jewelry, makeup, and love. I only like music, video games, dragons, animals, and food. If any guy reading this still hasn't given up on liking me, you're toast. So you’re asking us to be perfect, which people aren’t capable of being. We all have at least one of these imperfections (men too) and they show up at different points in our lives. We aren’t just ,say, the jealous girl or guy. People are so much more than one big problem. If someone loves the person they’re in a relationship with, they will be open about issues and work through them together. We are supposed to help each other grow, not single everyone out. I’m so so tired of these “how to be this” and “why you shouldn’t do that” and “these 100 signs means that this bad thing is happening” lists all over the internet. Stop tearing people down and attempting to fill our heads with lies about ourselves and the people we love. Oftentimes, these lists and proposals contradict one another. I came across an article the other day about signs that your guy is cheating, and “buying flowers on a rare occasion” was on the list. This could just as easily be on a list called “Reasons why your guy wants you to feel special” or “How to keep the spark alive in your relationship. How confusing? A video should not be telling us how to run our relationship. We have to trust our intuition and trust God with the people we hold close. There’s nothing wrong with several “types of girls” in this video anyway. Completely ridiculous and toxic. I’m glad I’ve finally realized that about this channel. How about for the next video do the flip side of this. The One is not always good with the guys mom, one of the things my husband loves about me is that I'm not good with her, I stand up to her, tell her off, and I'm not afraid to slap her across the face if she steps too far out of line, then again he hates her because of the decades of verbal and emotional abuse he suffered because of her. I'd say I'm a tie between, "A Girl Your Mother Will Love," and, "Worried is Her Second Name." xD Truthfully, I worry, basically, nonstop. My life feels like it's a constant worry. Does anyone know the name of the movie scene shown at beginning? I'm definitely gonna end up single till my death…. you know introverts are just like that…. I also have a social anxiety…. I know that now…..cause even though i have that …. that person still can work as a cashier for example 🙂 (I work as a cashier). Well this is perfect, I'm an uneducated, introverted, mindless, gullible, emotionally flat orphan. I ought to be the perfect woman. Such a sad video. Keep estereotiping people, thats how you end up single forever. Or a girl jealous of the attention her man shows his own mother. Not me of course but have seen it before. Wait so I'm the one? A smart girl doesn't mean that. They USUALLY HAVE A REASON TO BE JEALOUS OR WORRIED! He has to text her back! It is decency/courtesy and respect!! That is not drama queens, guys just say that. But HE MAKES HER THAT WAY!! Why don't you guys cover what types of guys that shouldn't get married or women won't marry ? Which would be pretty much all of them . Why don't you people create a video on TYPES OF MEN WOMEN DON'T WANT TO MARRY!!! I mean, I get the whole miss drama, miss jealousy and and gossip girl not being the ones with potential, but the other other things? Really? I mean I’m a daddy’s girl but don’t only seek validation and help from him and I am the one his mother loves and my man loves my close bond with my dad and with his family. We met in university and yes at that time I was the study girl and still made time for him, my family, his family and my studies. I love fashion and make up for my personal “me time” yet my man is a long haired bearded type with baggy clothes. I don’t wanna change his style, in fact I love it more than low maintenance girls. Most girls who don’t care about fashion or make up, make a big deal about his long hair and his facial hair as well. Finally (this is just something people tell me) but I get a lot of compliments on my appearance and physique because I care a lot for my skin, hair and physical health, yet I don’t care to take selfies and focus on my appearance alone and attention I get from other men! I love bright side but this episode disappointed me a lot by not only putting us females in categories, but assuming things about girls based on one fact and even on outer appearance. I would probably fit into the Party Animal or Gossip Lover category. When the good Lord ran out of brains he made Woman.WO to man evermore.